ALMtoolbox ClearEnv is an add-on for IBM Rational ClearCase and intended for developers and CM administrators. 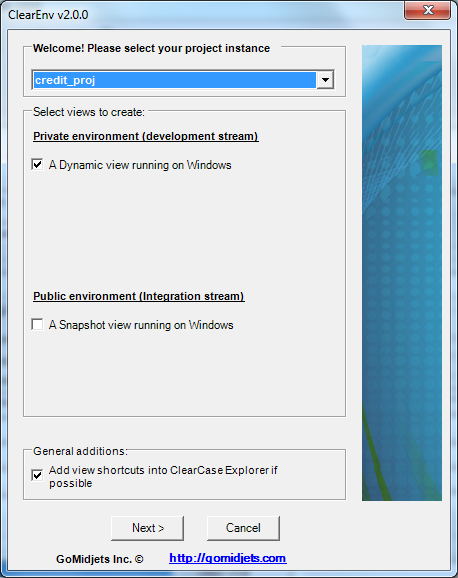 It offers a smart and simple alternative to the ClearCase UCM "Join Project" procedure. ALMtoolbox ClearEnv's main purpose is to let end-users (developers, team-leaders, QA staff and technical writers) automatically and independently create their own environments (ClearCase streams and views). This goal is achieved by using methodologies that are pre-defined by the CM administrator. Client dashboard - setup new work environments in two clicks! Setup new work environments in two clicks! Complete and automated process for end-users. Developers, QA staff or managers simply select their target project, and then ALMtoolbox ClearEnv does the rest and creates their ClearCase streams and views. Create your environments with any operating system. Environments can be created for Windows, UNIX, Linux and any Cross-Platform combination. Create your environments with 16 development methodologies over UCM. ALMtoolbox ClearEnv provides 16 development methodologies over feature-driven development (UCM), including XP programming, Agile, Scrum, Continuous Integration, CMMI and RUP and parallel and serial development. Integrate with the ClearCase Explorer dashboard. Let your users create view shortcuts and work on multiple dashboards. Integrate with your scripts. Run your scripts automatically after environments are created successfully, including environment variables for maximum flexibility. This will help you easily integrate with any IDE (Visual Studio, Eclipse and others). Graphic (GUI) and Command-Line (CLI) modes. 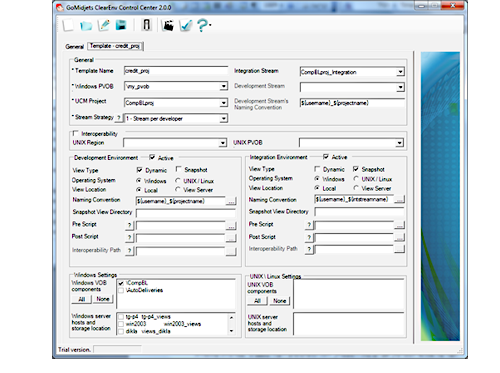 Create your environments with the ALMtoolbox ClearEnv graphic interface or automatically by using a pre-defined script. Central management and compliance. 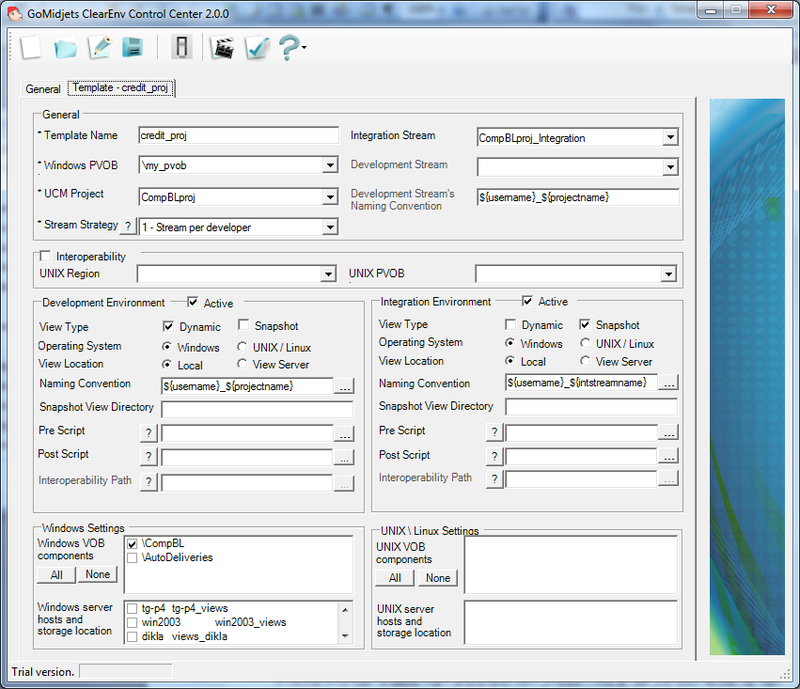 ALMtoolbox ClearEnv supports naming convention of streams, views and storage locations. Safety and security. ClearEnv security is based on your operating system and ClearCase security. No further customization is required. Easy installation - start working in 10-15 minutes. Customize ALMtoolbox ClearEnv for your specific needs in just a few minutes. All ClearCase versions are supported. Beginning with version 2003.06, and including ClearCase LT and ClearCase MultiSite, Base ClearCase and UCM ClearCase. Supports all 3rd party storage software and hardware including NAS storage filers like NetApp and EMC, NFS, Samba and TAS.